Watching Nico Young throughout the elite 3200 meter race on Saturday at the Arcadia Invitational, you would have gotten the sense that he was in over his head. 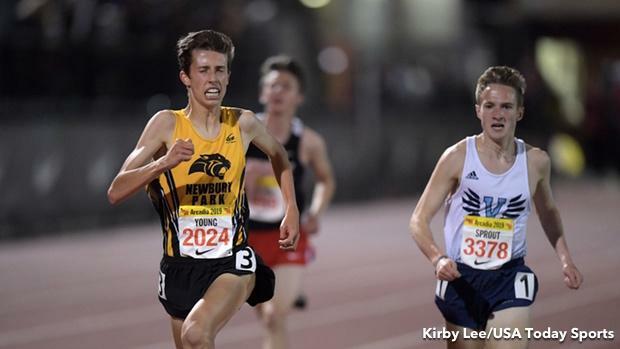 The Newbury Park High School junior doesn't exactly look comfortable at high speeds. But that wouldn't have told the larger story about how ready the national-leader at 1500m was for this race. Previous to Saturday's outing at the distance, Young told MileSplit he was shooting for a time of 8:40. By race's end, Young had accomplished that feat, scoring the third-fastest time at the distance all-time in 8:40.00 and the eighth fastest 2-mile based on the outdoor conversion. "I'm super excited and stoked for this because it's been something I've been looking forward to for a lot of the season," he said. Oddly enough, he didn't do it alone. That was the other fascinating part to this story. Valor Christian (CO) junior Cole Sprout covered the entire distance, up until the final 50 meters, in the lead before Young, who had 3:48 1500m speed, found another gear and strode past Sprout for the win at the finish. "I knew the competition would be the toughest ever this season for me, so if by the 800 mark the race wasn't going too fast I was going to try to lead the middle of the race," Young said, "but Cole Sprout is such a phenomenal runner he took it out there. I stuck with him and finished the race from there." Sprout's plan was obvious from the start. The third-place finisher at NXN and the national leader at 1600 meters took the lead from the gun and raced out to a 64-second first lap. Young begun to set into a rhythm by the third lap, slotting beyond Sprout. The Californian's plan was to hold even splits through the 1600m markers, going through at 4:20. And Sprout and Young both went through the halfway point at about 4:22 -- the point in which they began to break away. Young's coach, Sean Brosnan, told MileSplit on Sunday that he didn't plan on shadowing Sprout the entire race, but whenever Young made a move in the back-end of the race Sprout surged. It was clear this race would come down to the final steps. As both athletes held steady at 66-second laps from the second mark on through the sixth, the pace toggled in moments, with slight moves being made. Sprout answered them all. Both athletes surged on the bell lap -- by then, the lead was so significant, the third-place athlete was about 30 meters behind -- and Sprout went to the gas while Young chased. But on the final turn, about 150 meters out from the finish, Young found another gear and swung on the outside. The Newbury Park athlete had to go to the third lane to bypass a flagging runner on the straightaway before turning on the jets and finishing on top. "I focused on staying on him," Young said. "I knew that if I lost him, it would be that much harder to come back, so it's just a mental game really." Astonishingly, a total of four athletes went under the winning time of 8:50.95 from 2018. All four went under 8:50, with Homestead's (WI) Drew Bosley -- he broke 9-minutes in 2018, going 8:59.04 -- finishing third overall in 8:49.28. Jacksonville Bolles' (FL) Charles Hicks was fourth in 8:49.62. Chattanooga Red Bank's (TN) Cole Bullock was fifth in 8:50.70. The two pre-race favorites, Liam Anderson and Matt Strangio, perhaps felt the effects of recent races, with Anderson falling to seventh in 8:51.91 -- his third sub-9 performance on the season -- and Strangio the first athlete outside 9-minutes, finishing 15th in 9:00.58. Just 14 athletes broke 9-minutes, a downturn from 16 in 2018 and 27 from 2017. Katelynne Hart is developing a bit of a reputation for fast starts. 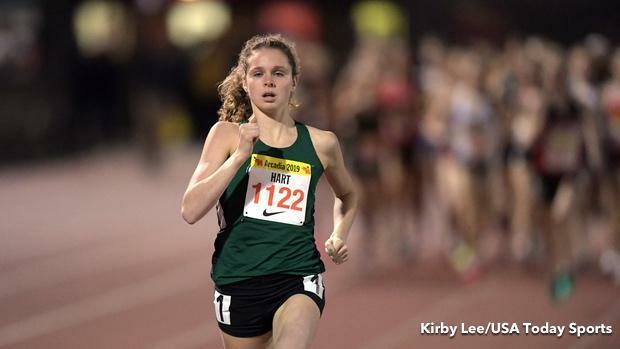 The Glenbard West (IL) High School junior, who won this race last year in 9:52.02, went out in a blistering 65 seconds -- which was eight seconds faster than the elite girls mile's first lap! -- and developed a lead of over 50 meters just 400 meters into the race. "After the first 100 I just tried to get out of the pack and take the lead," Hart said. At that point Hart simply needed to hang on, and she did just that, posting a time of 9:59.57 to win by over 12 seconds. Rawlins (WY) sophomore Sydney Thorvaldson was second overall in 10:12.18, while Buchanan's (CA) Meagen Lowe was third in 10:12.78. "Today was the day to try and best my 9:52, but I was hoping to go out a little more conservative than I did. From that, I had to stay mentally tough the rest of the race and give it all I had the last mile and 800."